Here are some things that really matter to us. Determining a company’s why isn't based on rocket science and shouldn't be a mysterious process. Discovering a company's why comes from paying attention to what's actually unifying and inspiring a company and its senior leadership team to create together and come to work each day. So you only have to remain curious, watch, listen and discover. As with other companies, discovering our why took a bit of time and lots of observation. At first, in an attempt to capture our why, we used the language “thriving together,” but that didn’t capture the true energy or spirit of our why. Working with language to try and describe the essence of something, especially a non-material thing, can be challenging. Over time, we discovered that we expressed regularly a desire to be in business together in a way that honored our truest and most wholehearted self - individually and collectively. This is the "self" that we refer to in our Personal Life Plans and sometimes refer to as our “2.0 self.” We noticed that when we committed ourselves to working together and helping each other be our truest most powerful self, we naturally became more present, more connected and more relevant - with ourselves, each other and our clients. Giving energy to writing down words to accurately capture what we’ve pointed to in our words above is challenging and potentially distracting. But being humans fully alive in a world filled with other human beings enamored with communicating through language (written and spoken) we knew we needed words and phrases to capture this energy and spirit. So we’ve chosen to unite our expression around the phrase “awakening and transforming” to describe Mazzi’s why. For us this awakening and transforming energy, includes thoughts or phrases like: being authentic and wholehearted in our engagements, being vulnerable with our thoughts and emotions, being transparent about how we’re experiencing the world at any given moment, being constantly curious about current reality and telling the truth about ourselves and the situations we’re in. Be committed to awakening and transforming isn’t ever a destination for us. It’s a journey. It’s an adventure. These phrases aren’t trite for us. This awakening and transforming energy fuels how we work and partner together internally and how we partner with and serve our clients. This energy, this way of being, will continue should Mazzi ever cease as a business. (this is one of the foundational characteristics to look at when trying to discover a company’s why) We are in this adventure of awakening and transforming for life. As we partner alongside each other and as we deliver Mazzi’s services to our clients we are relentless devotees of living this why. We have infused all of our products and services with this powerful why. Our why gets us up every day. Our why inspires us to love and support each other and our clients. Our why is deeply personal. And our why is attracting each of us to live a life that’s both meaningful and purposeful. First, get to know and learn to appreciate your Maker intimately, realizing just how BIG and truly GREAT He is. Breathe Him in deep, take a sunrise walk with Him (in the snow is nice), explore the beauty of nature with Him, hold hands and play with one of His precious children, minister to someone who is dying, hanging out where life is at its most raw, where it's fully at risk and hanging in the balance, where it's most appreciated, and when you hear His voice calling you, instructing you, inviting you to do something - stop, listen, and obey, no matter what. Second, appreciate the beauty and great gifts that are a healthy body, a curious mind, and a vibrant spirit. Care for them, feed them healthy food, protect them, stretch them, and, most importantly, enjoy them, being sure to never abuse, ignore, or poison them, ever. They are the essence of your capacity for co-creation with God and human productivity. When any one of these cry out for attention - stop, listen, and tend to them, no matter what (unless God's called first). Also, remember that the best way to truly love and honor this human "self" in life is to fully and completely love your God. Third, if you are fortunate enough to have a partner, appreciate the beauty and great gift that is this other person. Care for them, feed them healthy, loving interaction, protect them, stretch them, and, most importantly, enjoy them, being sure to never abuse, ignore, or poison them, ever. They are your best and most reliable human support for tending the garden that is your life. They are the essence of your capacity for love and partnership. When they cry out for attention - stop, listen, and give it, fully and immediately, no matter what (unless God or your own health and well-being has called first). Also, remember that the best way to love another person is to fully and completely love yourself. Fourth, if you are blessed with children, appreciate the beauty and wonder that they are. Care for them, feed them healthy food, protect them, stretch them, and, most importantly, enjoy them, being sure never to abuse, ignore, or poison them, ever. They are the essence of your capacity for boundless joy and patient surrender. When they cry out for attention - stop, listen, and give it, fully and immediately, no matter what (unless God, your health, or your partner have called first). Also, remember that the best way to parent your children is to genuinely love your partner, their other parent. Fifth, if you are blessed with living parents and siblings, appreciate the beauty and great gift that they are. Care for them, feed them your acknowledgement and thanks for their crucial role in your life, protect them, stretch them, and, most importantly, enjoy them and give them access to enjoying you, being sure never to abuse, ignore, or poison them, ever. They are the essence of your capacity for compassionate forgiveness and blessed thankfulness. When they cry out for attention - stop, listen, and give it, fully and immediately, no matter what (unless God, your health, your partner, or your children have called first). Also, remember that the best way to honor your parents and your family of origin is to live a rich, healthy, and happy family life. Sixth, in your chosen communities (including church, neighborhood, non-profit affiliations, etc. ), appreciate the beauty and great gift that they are. Care for them, feed them your presence and your available resources, protect them, stretch them, and, most importantly, enjoy them and give them access to you, being sure never to abuse, ignore, or poison them, ever. They are the essence of your capacity for unrestricted generosity and selfless service. When they cry out for attention - stop, listen, and give it, fully and immediately, no matter what (unless, of course, God, your health, your partner, your children, or your family of origin have called first). Also, remember that the best way to serve others and be served is to live a connected, healthy, and loving relational life; it is not about your money or resources, but YOU. And, finally, if you are blessed with meaningful, useful work to do to earn an income, appreciate the beauty and great gift that this is. Care for your work, feed it your presence and your passion for your life, protect it, stretch it, and, most importantly, enjoy it and give it your very best (which will be available only when working from the above to here - from the inside out), being sure never to abuse, ignore, or poison it (by bringing your life's chaos to the office and other people), ever. It is the essence of your capacity for creativity, making a difference in the world, and the healthy and self-sustaining abundance that comes with these. When it cries out for attention - stop, listen, and give it, fully and completely, no matter what (but only from the foundation of a properly cared for and cultivated life - you cannot truly give what you do not genuinely have). Also, remember that the best and most reliable way to "perform" at work, in a way that makes a difference and creates and sustains life over the long haul, is to live a life that truly works according to God's plan. 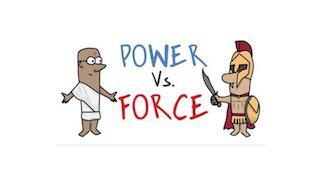 Select "Power Vs. Force" to find out more about the distinction between power and force. Power and force are two different, even contradictory concepts, energies or modes of operation. Using force implies one is to go up against something. Using power, on the other hand, implies one is accessing an inner strength, which is in sync with a truth that one not only knows, but has experienced deep within. History has shown that in the long run, the use of power leads to welcome and effective results, much more so than the use of force. allowing, co-creating or holding the space for the unfolding of events versus consistently and aggressively expending energy to dominate, get your way, manipulate or coerce others.